Pest description and crop damage Larvae of both species are small (0.12 inch long), cream-colored, legless and C-shaped. Red sunflower seed weevil adults are 0.1 inch long and reddish brown. 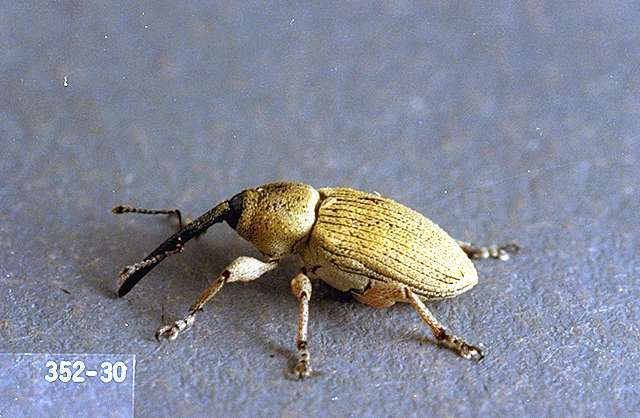 Adults of the gray sunflower seed weevil are slightly larger (0.14 inch long) than S. fulvus and gray. Red sunflower seed weevils usually only partially consume seeds, but separating undamaged from weevil-damaged seed is difficult. Most larvae drop from the head to the soil after completing their development, but a small percentage may remain in the seed to pupate, and those can cause heating and moisture problems at harvest and bin-filling time. Growers who find a seed weevil infestation should delay harvest to allow most weevil larvae to leave the seeds. Seeds infested by the gray seed weevil lack a kernel and seeds may be lost during harvest, due to their light weight. Because of the gray sunflower seed weevil's low population levels and low fecundity, it usually does not cause economic damage, especially in oil sunflower fields. Economic threshold Economic thresholds vary with differences in plant population, insecticide and application cost, and sunflower's market price. chlorpyrifos/lambda-cyhalothrin (Cobalt Advanced) at 16 to 38 fl oz/a. Do not graze or feed treated forage. PHI 45 days. REI 24 hr. lambda-cyhalothrin/chlorantraniliprole (Besiege) at 6 to 10 fl oz/a. Do not apply more than 0.12 lb ai/a per season of lambda-cyhalothrin or more than 0.2 lb ai/a of chlorantraniliprole. PHI 45 days. REI 24 hr.